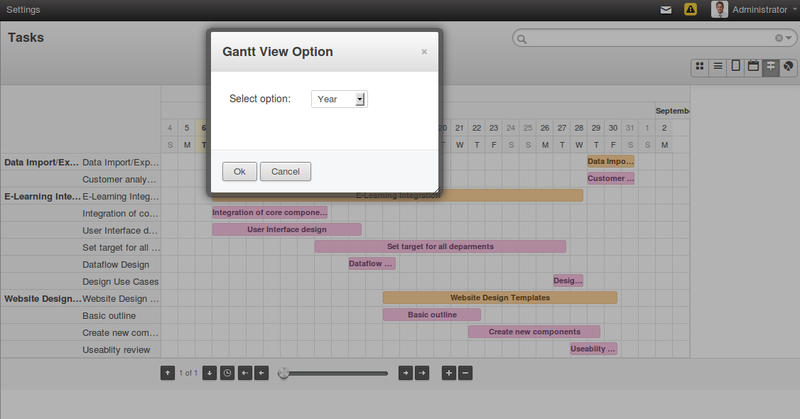 OpenERP webclient has many useful features like calendar, gantt chart, graph view. But, all these features are made as a generic way. Recently we have come up with a new enhancement in Gantt Chart. OpenERP default Gantt Chart has some limitation. So we simply tried to provide more detailed view using third party library. Following screen shows default OpenERP Gantt Chart. We are trying to provide Day, Month, Year wise data display in Gantt Chart that you can see in below screen. Here we have screen which allows us to select View. If we select Year as an option, then Gantt Chart will display Year wise data. If we select Month as an option, then Gantt Chart will display Monthly data as displayed in the screen below.